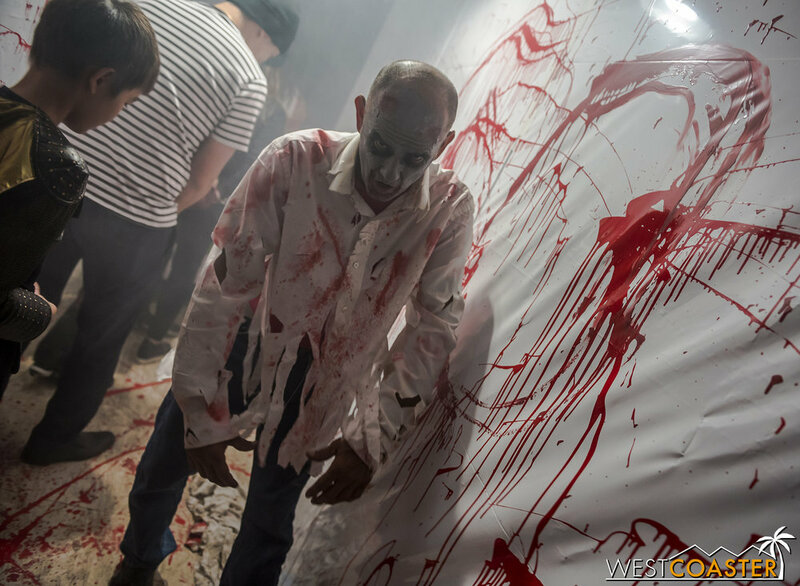 Most home haunts work feverishly throughout September and October (and sometimes even earlier) to build walls, construct sets, install theming, run wiring and sound, and finish their productions in time for a one or two weekend run at the very end of Halloween season. It’s a plethora of work for a limited reward of seeing everything come into place, but that’s what makes home haunts special: the average, everyday citizen haunters are so dedicated and passionate to their craft that they are willing to invest all this time for a limited run. And then, there’s Hauntington Haunt Manor, which stands unique among all the Southern Californian home haunts that I’ve seen in that its operating dates stretch the entire month of October, running Fridays and Saturdays of each weekend, plus Halloween night. Out of all the home haunts I’ve been to, this comes to the closest to a professional attraction—not only because of its extended nights in comparison to the average residential haunted house, but also because owner William Horskey and his family produce a brand new theme every year that sprawls all around his Huntington Beach property. 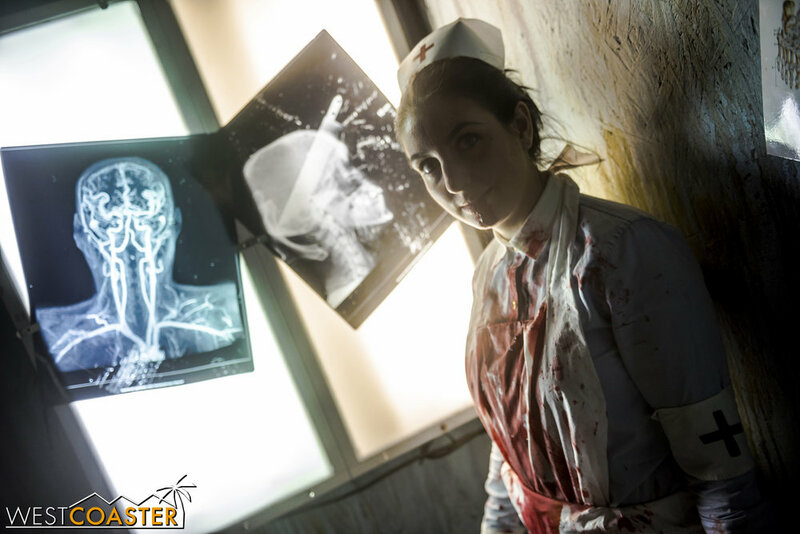 This year, Hauntington Beach Manor presents “Quarantine,” a zombie-themed epidemic, and I stopped by late last month to see what all the buzz and screams were all about! 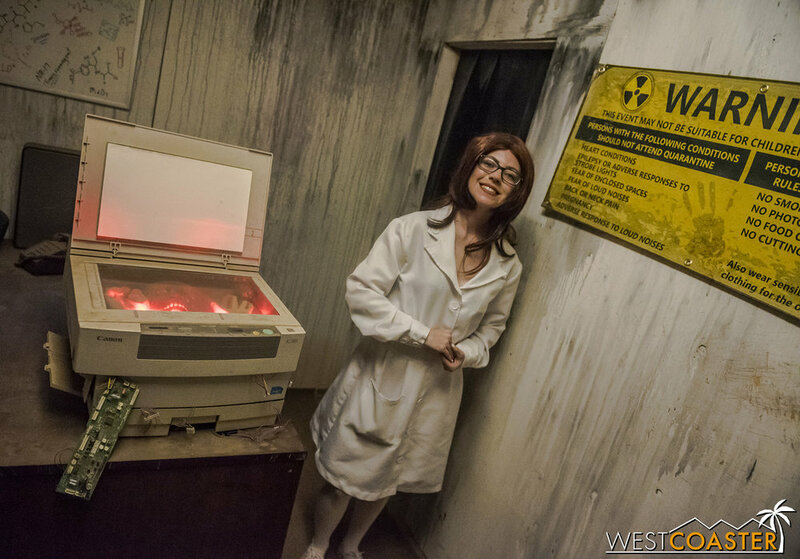 Welcome to the quarantine zone! This cheerful official explains the situation and the rules, then sends guests off to their certain doom. Located in a typical suburban street in Orange County, there’s no reason to suspect the Horskey house is home to anything out of the ordinary for most of the year. But come Halloween season, signs of a frightful manifestation clearly begin to emerge! For 2018, the exterior is a graffiti-scrawled shamble of a structure that hides a post-apocalyptic scene overridden by the undead. On most nights, the line to enter stretches outside and even down the street, growing longer and longer as the calendar approaches Halloween. 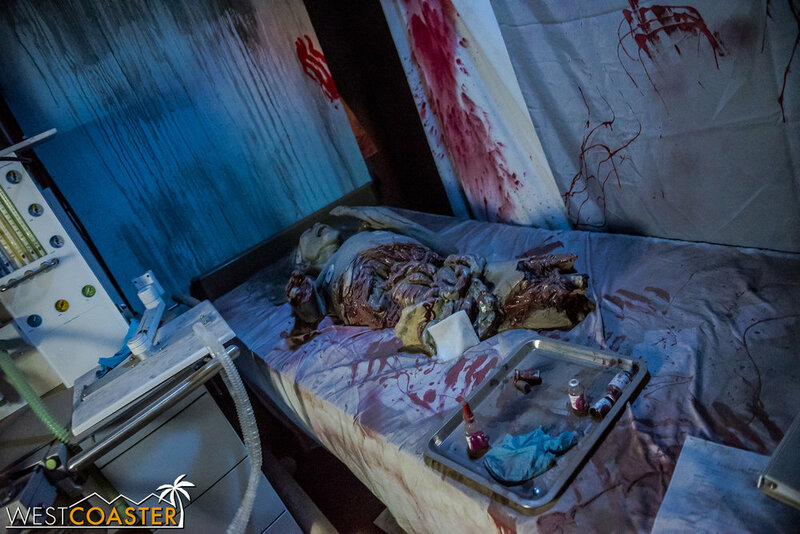 Hauntington Beach Manor does not shy away from gory and graphic props and displays. Unlike most home haunts, Hauntington Beach Manor has a mandatory donation of $5 per person to enter. But worry not, the cost goes to a good cause. In this case, two good causes, as this year’s proceeds were charitably given to Patriots and Paws, an organization that works to furnish new residences for veterans and partner them up with a rescue companion animal if needed, and Children’s Hospital of Orange County, whose life-saving work is well known. Once that gift is paid, it into the containment area and off into the zombie zone. 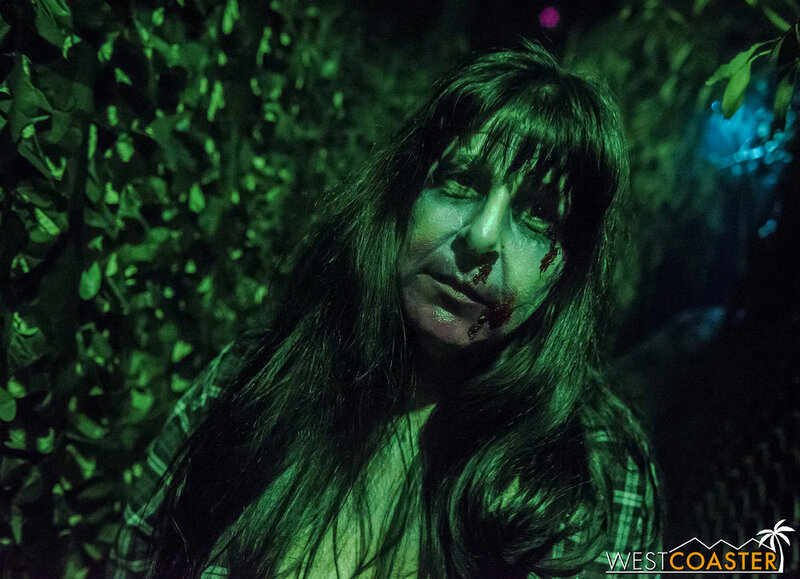 Home haunts through Southern California range from fun, whimsical, family-friendly experiences to deeply immersive, hyper-realistic worlds to old-fashioned gore-fests. Hauntington Beach Manor belongs most closely to the last category. There is plenty of violent blood and gore within, torn bodies, mutilated corpses, and severe carnage. It bills itself as one of the scariest home haunts in Orange County, keeping a regular running tally of guests who’ve had to “chicken out,” and it very much engages in what is known as “hard” scares—intimate, intense pop-out scares and pursuit by a swarming host of scareactors that seem to endlessly come out of the woodwork throughout the maze. This person most definitely did not survive the zombie invasion. And then it’s off to the backwoods. Quarantine itself seems to stretch on and on a surprisingly sprawling length, especially considering that it opens so relatively early in the season! The Horskeys do add on to the maze with each passing weekend, so visiting on the later in the month will yield a different aesthetic richness than stopping by earlier in the month, but the depth of theming and quality are pretty darn strong regardless of when one stops by. 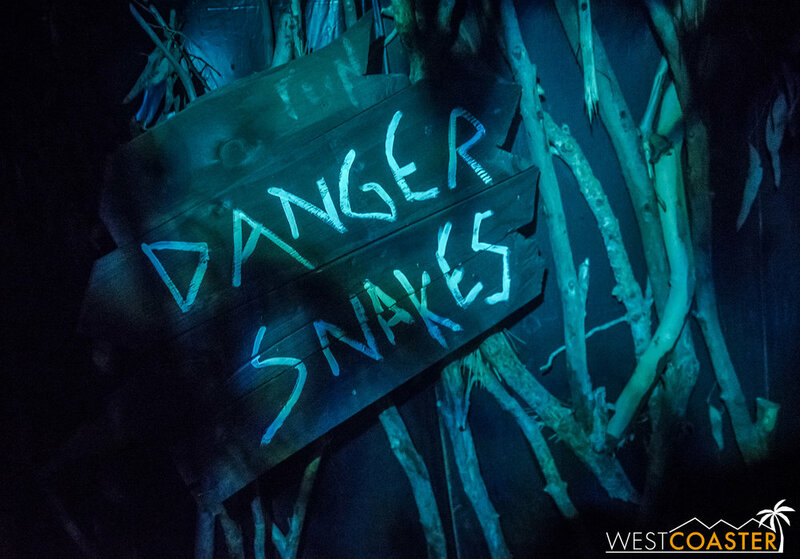 This year, the maze seemed to split between an infected medical area full of victims and remnants of the undead outbreak before transitioning into a wilderness area full of things like “Danger Snakes” (much more threatening than safety snakes) and “Whispering Woods” and bayou creeps. Then it’s back into the realm of zombies before barely escaping out—hopefully unbitten! The degree to which Hauntington Beach Haunt rivals the breadth and action of a professional haunt is very impressive. It’s not as slick and polished as a modern day Knott’s Scary Farm maze (at least this year’s visuals did not look that way), but it would blend in quite nicely at Knott’s 10 or even 5 years ago. 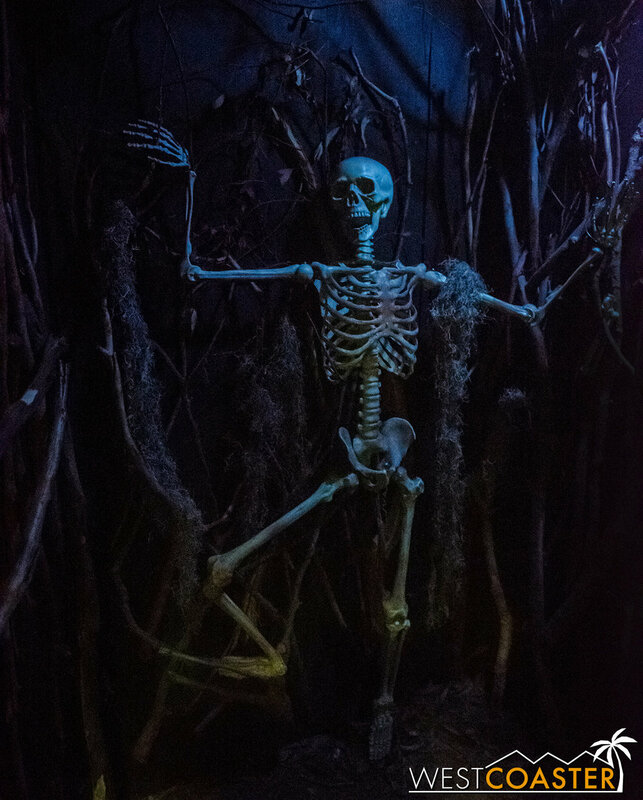 From bloody laboratory rooms to mysterious forests to gruesome murder shacks, this haunted house steps on the pedal and never lets up. 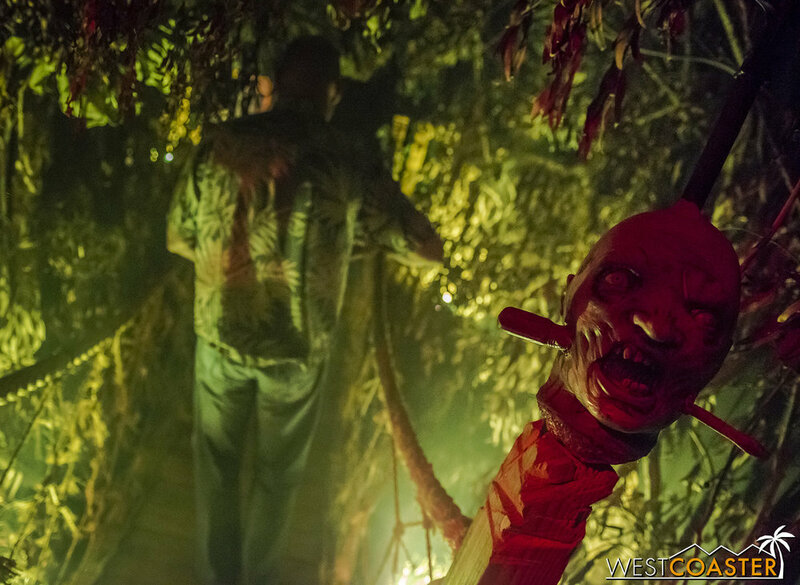 The actors are also engaging and energized, cooking up scares and shrieks of terror throughout the maze. Thoroughly committed character, they spring out of hiding places or prowl down winding halls, always looking for fresh victims. The degree to which they maintain their scares is pretty fantastic, never wavering, always looking to maximize the terror. 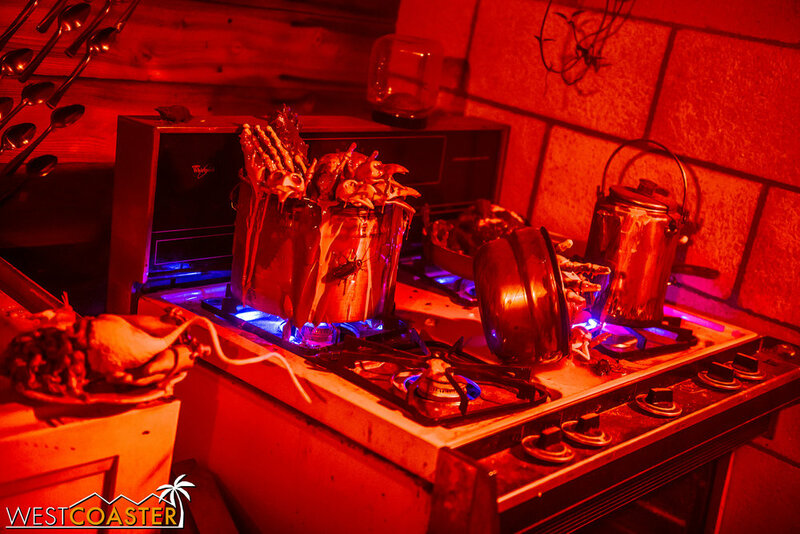 Just a small detail, but the way the stove was lit and portrayed was really cool. I came into Hauntington Beach Manor intrigued about its reputation (especially since I had not previously heard of this local-to-me haunt) but not sure exactly what caliber to expect. I left thoroughly impressed and determined to make it out to Hauntington earlier next year to see what new terrors the Horskeys bring. 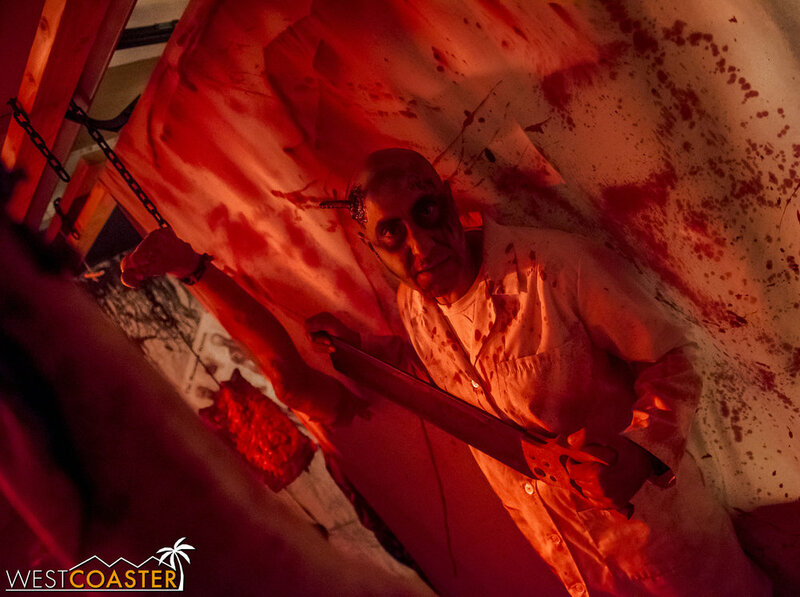 I’ve said before that it’s always refreshing to find a quality Orange County-based haunted attraction, since so many of them seem to be clustered in Los Angeles and the Valley. Hauntington certainly fits the bill! Hauntington Beach Manor is located on 9631 Sailfish Dr, Huntington Beach, CA 92646 and operated Fridays and Saturdays (but not Sundays) on each weekend of October, plus Halloween night. As mentioned, there is a requested donation, which blurs the boundary between typical home haunt and professional haunt, but the proceeds go to two great causes. 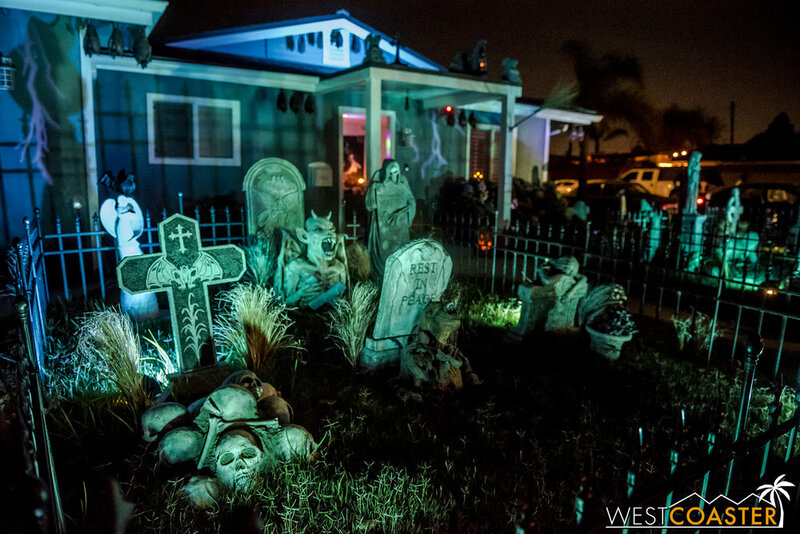 Haunt enthusiasts—especially those in the OC—should put this on their calendars next year. It’s sure to be a scream! Oh, and as a P.S., there was also this cool little yard display at the house just down the street at the corner of Sailfish Drive and Salmon Lane. It didn’t have any particular name, and the owner, who has been doing this for twenty years, does it out of passion rather than attention. But it was pretty cool to see and a nice little bonus for visiting Hauntington Beach Manor!